Man carrying a hammerhead in the streets of Mogadishu (Somalia). The known species range from 0.9 to 6.0 m (3.0 to 19.7 ft) in length and weigh from 3 to 580 kg (6.6 to 1,278.7 lb). They are usually light gray and have a greenish tint. Their bellies are white, which allows them to blend into the ocean when viewed from the bottom and sneak up on their prey. Their heads have lateral projections which give them a hammer-like shape. Hammerheads have disproportionately small mouths. They are also known to form schools during the day, sometimes in groups over 100. In the evening, like other sharks, they become solitary hunters. National Geographic explains that hammerheads can be found in warm tropical waters, but during the summer, they participate in a mass migration to search for cooler waters. Since sharks do not have mineralized bones and rarely fossilize, their teeth alone are commonly found as fossils. The hammerheads seem closely related to the carcharhinid sharks that evolved during the mid-Tertiary period. According to DNA studies, the ancestor of the hammerheads probably lived in the Miocene epoch about 20 million years ago. Using mitochondrial DNA, a phylogenetic tree of the hammerhead sharks showed the winghead shark as its most basal member. As the winghead shark has proportionately the largest "hammer" of the hammerhead sharks, this suggests that the first ancestral hammerhead sharks also had large hammers. Fossils show that hammerheads might have evolved earlier during the Paleocene. A theory has been advanced that the hammer-like shape of the head may have evolved (at least in part) to enhance the animal's vision. The positioning of the eyes, mounted on the sides of the shark's distinctive hammer head, allows 360° of vision in the vertical plane, meaning the animals can see above and below them at all times. The shape of the head was previously thought to help the shark find food, aiding in close-quarters maneuverability, and allowing sharp turning movement without losing stability. However, the unusual structure of its vertebrae has been found to be instrumental in making the turns correctly, more often than the shape of its head, though it would also shift and provide lift. From what is known about the winghead shark, the shape of the hammerhead apparently has to do with an evolved sensory function. Like all sharks, hammerheads have electroreceptory sensory pores called ampullae of Lorenzini. The pores on the shark's head lead to sensory tubes, which detect electricity given off by other living creatures. By distributing the receptors over a wider area, like a larger radio antenna, hammerheads can sweep for prey more effectively. Reproduction occurs only once a year for hammerhead sharks, and usually occurs with the male shark biting the female shark violently until she agrees to mate with him. The hammerhead sharks exhibit a viviparous mode of reproduction with females giving birth to live young. Like other sharks, fertilization is internal, with the male transferring sperm to the female through one of two intromittent organs called claspers. The developing embryos are at first sustained by a yolk sac. When the supply of yolk is exhausted, the depleted yolk sac transforms into a structure analogous to a mammalian placenta (called a "yolk sac placenta" or "pseudoplacenta"), through which the mother delivers sustenance until birth. Once the baby sharks are born, they are not taken care of by the parents in any way. Usually, a litter consists of 12 to 15 pups, except for the great hammerhead, which gives birth to litters of 20 to 40 pups. These baby sharks huddle together and swim toward warmer water until they are old enough and large enough to survive on their own. In 2007, the bonnethead shark was found to be capable of asexual reproduction via automictic parthenogenesis, in which a female's ovum fuses with a polar body to form a zygote without the need for a male. This was the first shark known to do this. Hammerhead sharks are known to eat a large range of prey such as fish (including other sharks), squid, octopus, and crustaceans. Stingrays are a particular favorite. These sharks are often found swimming along the bottom of the ocean, stalking their prey. Their unique heads are used as a weapon when hunting down prey. The hammerhead shark uses its head to pin down stingrays and eats the ray when the ray is weak and in shock. The great hammerhead, tending to be larger and more aggressive than most hammerheads, occasionally engages in cannibalism, eating other hammerhead sharks, including its own young. In addition to the typical animal prey, bonnetheads have been found to feed on seagrass, which sometimes makes up as much as half their stomach contents. They may swallow it unintentionally, but they are able to partially digest it. This is the only known case of a potentially omnivorous species of shark. According to the International Shark Attack File, humans have been subject to 17 documented, unprovoked attacks by hammerhead sharks within the genus Sphyrna since 1580 AD. No human fatalities have been recorded. 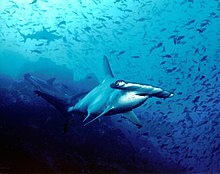 The great and the scalloped hammerheads are listed on the World Conservation Union's (IUCN) 2008 Red List as endangered, whereas the smalleye hammerhead is listed as vulnerable. The status given to these sharks is as a result of overfishing and demand for their fins, an expensive delicacy. Among others, scientists expressed their concern about the plight of the scalloped hammerhead at the American Association for the Advancement of Science annual meeting in Boston. The young swim mostly in shallow waters along shores all over the world to avoid predators. Shark fins are prized as a delicacy in certain countries in Asia (such as China), and overfishing is putting many hammerhead sharks at risk of extinction. Fishermen who harvest the animals typically cut off the fins and toss the remainder of the fish, which is often still alive, back into the sea. This practice, known as finning, is lethal to the shark. In native Hawaiian culture, sharks are considered to be gods of the sea, protectors of humans, and cleaners of excessive ocean life. Some of these sharks are believed to be family members who died and have been reincarnated into shark form. However, some sharks are considered man-eaters, also known as niuhi. These sharks include great white sharks, tiger sharks, and bull sharks. The hammerhead shark, also known as mano kihikihi, is not considered a man-eater or niuhi; it is considered to be one of the most respected sharks of the ocean, an aumakua. Many Hawaiian families believe that they have an aumakua watching over them and protecting them from the niuhi. The hammerhead shark is thought to be the birth animal of some children. Hawaiian children who are born with the hammerhead shark as an animal sign are believed to be warriors and are meant to sail the oceans. Hammerhead sharks rarely pass through the waters of Maui, but many Maui natives believe that their swimming by is a sign that the gods are watching over the families, and the oceans are clean and balanced. The relatively small bonnethead is regular at public aquariums as it has proven easier to keep in captivity than the larger hammerhead species, and it has been bred at a handful of facilities. Nevertheless, at up to 1.5 m (5 ft) in length and with highly specialized requirements, very few private aquarists have the experience and resources necessary to maintain a bonnethead in captivity. The larger hammerhead species can reach more than twice that size and are considered difficult, even compared to most other similar-sized sharks (such as Carcharhinus species, lemon shark and sand tiger shark) regularly kept by public aquariums. They are particularly vulnerable during transport between facilities, may rub on surfaces in tanks, and may collide with rocks, causing injuries to their heads, so they require very large, specially adapted tanks. As a consequence, relatively few public aquariums have kept them for long periods. The scalloped hammerhead is the most frequently maintained large species, and it has been kept long term at public aquariums in most continents, but primarily in North America, Europe, and Asia. In 2014, less than 15 public aquariums in the world kept scalloped hammerheads. Great hammerheads have been kept at a few facilities in North America, including Atlantis Paradise Island Resort (Bahamas), Adventure Aquarium (New Jersey), Georgia Aquarium (Atlanta), Mote Marine Laboratory (Florida), and the Shark Reef at Mandalay Bay (Las Vegas). Smooth hammerheads have also been kept in the past. In March 2013, three endangered, commercially valuable sharks, the hammerheads, the oceanic whitetip, and porbeagle, were added to Appendix II of CITES, bringing shark fishing and commerce of these species under licensing and regulation. ^ a b Fossilworks Database. "Fossilworks Paleotology database". Fossilworks. John Alroy. Retrieved 2018-04-24. ^ Hessing, S. (2000). Sphyrna tiburo. Animal Diversity Web. Retrieved on 2012-12-19. ^ "Record Hammerhead Pregnant With 55 Pups". Discovery News. Associated Press. July 1, 2006. Archived from the original on June 22, 2011. Retrieved October 18, 2008. ^ Hammerhead Shark. Sharks-world.com. Retrieved on 2012-12-19. ^ "Hammerhead Shark". NationalGeographic.com. 2010-09-10. Retrieved November 9, 2016. ^ "Hammerhead shark study shows cascade of evolution affected size, head shape". ScienceDaily.com. University of Colorado at Boulder. May 19, 2010. Retrieved November 9, 2016. ^ Martin, R. Aidan. "Origin and Evolution of the 'Hammer'". elasmo-research.org. Retrieved January 31, 2005. ^ McComb, D. M.; Tricas, T. C.; Kajiura, S. M. (2009). "Enhanced visual fields in hammerhead sharks". Journal of Experimental Biology. 212 (24): 4010–8. doi:10.1242/jeb.032615. PMID 19946079. ^ McComb, D. Michelle; et al. (2009-11-27). "Hammerhead shark mystery solved". BBC News. Retrieved 2010-05-04. ^ "World's Deadliest: Hammerhead Sharks". video.nationalgeographic.com. Retrieved 2015-05-23. ^ Otfinoski, Steven (2000). Hammerheads and Other Sharks. World Book, Inc. p. 16. ISBN 978-0716612100. ^ Martin, R. Aidan (August 1993). "If I Had a Hammer". Rodale's Scuba Diving. Retrieved March 31, 2006. ^ a b c Hammerhead Shark. Aquatic Community. Retrieved on 2012-12-19. ^ Chapman, DD; Shivji, MS; Louis, E; Sommer, J; Fletcher, H; Prodöhl, PA (2007-08-22). "Virgin birth in a hammerhead shark". Biology Letters. 3 (4): 425–7. doi:10.1098/rsbl.2007.0189. PMC 2390672. PMID 17519185. ^ "Great hammerhead shark". EnchantedLearning.com. Enchanted Learning Software. Retrieved December 19, 2012. ^ Hannah Lang (29 June 2017). "This Shark Eats Grass, and No One Knows Why". National Geographic. ^ "Eusphyra blochii (Slender Hammerhead, Winghead Shark)". iucnredlist.org. Retrieved 2015-02-18. ^ "Sphyrna corona (crown shark, mallethead shark, scalloped bonnethead)". iucnredlist.org. Retrieved 2015-08-30. ^ "Catalogue of Life: Sphyrna gilberti Quattro, Driggers III, Grady, Ulrich & Roberts, 2013". catalogueoflife.org. Retrieved 2015-08-30. ^ "Statistics on Attacking Species of Shark". Florida Museum of Natural History. Retrieved 2017-12-27. ^ "Panamanian officials find half ton of shark fins". WashingtonPost.com. Associated Press. 2011-02-25. ^ Sharks Highly respected in Hawaiian Culture. Moolelo.com (2004-09-28). Retrieved on 2012-12-19. ^ Compagno, L.; M. Dando & S. Fowler (2004). Sharks of the World. HarperCollins. p. 325. ISBN 978-0-00-713610-0. ^ "Babies Of The S.E.A. – Bonnethead Shark". SEA Aquarium. November 2013. Retrieved 2017-09-13. ^ "The Bonnethead Shark Sphyrna tiburo: Is it Suitable for Home Aquariums?". TFH MAagazine. September 2007. Retrieved 2017-09-13. ^ "Scalloped Hammerhead, Sphyrna lewini (Griffith & Smith)". elasmollet.org. Retrieved 2017-09-13. ^ "Scalloped hammerhead shark". Zootierliste. Retrieved 2017-09-13. ^ "Great Hammerheads, Sphyrna mokarran (Rueppell, 1837) in Captivity". elasmollet.org. Retrieved 2015-12-17. Wikimedia Commons has media related to Sphyrnidae. Froese, Rainer, and Daniel Pauly, eds. (2011). "Sphyrnidae" in FishBase. February 2011 version. "New shark discovered in US waters". BBC News. 10 June 2006. Retrieved November 9, 2016.